​One of the biggest problems that parents face with making the switch from driving to work to bike commuting has nothing to do with the commute itself – rather, the difficulty is in getting your kids to work or school without a car. ​Is Bike Commuting with Your Kids Right for You? ​What Kind of Bike Setup Do You Need? ​Adding kids into your mix can quickly escalate the number of things you need to consider when bike commuting, but it shouldn’t stop you from hopping on your bike every morning. Instead, there are some ways to include your children in your bike commute so that you can still get in your morning ride and they can get to school. In this article, we’ll cover some of the main things to consider when deciding whether to bike commute with your kids and how to manage it most effectively. ​Before we dive into the details of how to make bike commuting with kids work for your morning routine, it’s worth taking a moment to reality-check whether bike commuting with your kids is the right option for you and them. One of the main things to think about is whether a route involving a stop at their school on the way to your workplace is realistic – is their school on the way, or does it add several miles to your commute? You also need to consider the timing of the commute and the flexibility of your work schedule, since many schools start significantly earlier than 9 AM. If you also need to pick your kids up from school in the afternoon, that can further complicate the timing since schools typically end earlier than the traditional 5 PM end to the workday. Although most kids will eventually learn to love bike commuting, the initial hurdle of getting them onto the bike every morning – especially on days when the weather is cold or rainy – can also be a significant challenge to getting into the habit of bike commuting with kids. That said, bike commuting with your kids has a wide variety of benefits beyond the standard bike commute. Commuting with your kids allows you to spend extra time with them each day, which is something many parents feel like they can never get enough of in the midst of busy school and work schedules. For many parents, time spent bike commuting is also a time of a higher quality since there is always something new to talk about with your children – what you see on the road as you bike by. If your children are old enough to ride their bikes rather than sit on the back of yours, bike commuting is a great way to add exercise to their routine and potentially help them fall in love with cycling, which can, in turn, encourage them to commute to school or college and work for the rest of their lives. ​If you’ve weighed the pros and cons and determined that bike commuting with your kids is something that you can handle, there are some ways that you can make the commute easier on yourself and them and safer for everyone. The first, and most important, is getting the right bike setup for you and your children, especially if they are not able to ride their own bikes. Here, we’ll cover the pros and cons of some of the most popular setups. ​If you have multiple kids, experiment with mixing and matching these bike setups. Allowing your older child to ride their bike while putting your younger child in a child seat attached to your bike might work well for some kids. On the other hand, having two young children who are close in age might require towing a two-seat trailer and upgrading to two kid’s bikes at the same time when both kids are ready. One of the most common and least fussy methods of attaching your child to your bike – if they are not old enough to ride themselves – is to use a child seat. These seats typically attach to the rear of the bike on a specially fitted rack, although this most often requires that your bike has eyelets for a rack. Other seats can be attached directly to the handlebars on the front of the bike. In either case, child seats are secure, balance the weight of the child well, and often leave some space for storing your own lunch and other items similar to a pannier. Tag-along setups involve attaching a kids bike to your own bike via a metal tether, such that you can ride your bike as you normally would but tow your child along behind you on their own bike. ​(​Note, However, that although they can pedal, they don’t have to). The main downside to tag-along is that even after you drop your child off at school, you’ll still be trailing the kid's bike behind you. Towing a trailer can be hard work, but for parents, with multiple children or who don’t like the weight of a child seat on their bike, it is often the best option. Trailers are essentially child carriages, outfitted with one or more child seats, that get towed directly behind your bike by attaching to a rear rack or even to your rear wheel. The advantage to trailers is that many come with built-in shade to protect small children from the sun and elements, and some trailers are even designed to handle gravel and dirt roads. 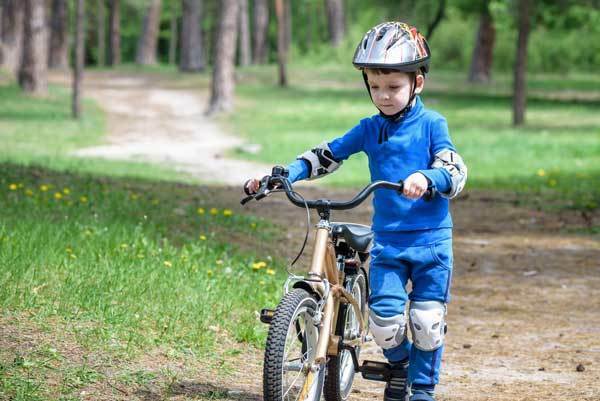 Although child seats, tag-alongs, and trailers work for the majority of parents who are bike commuting with kids, there are a few other options that are gaining in popularity. ​Tandem bikes, with a second seat designed specifically for children, are now widely available and preferred by many parents to tag-along setups. Also, some parents use cargo trailers rather than traditional trailers – while they may not be as custom-designed for children as child trailers, cargo trailers can serve a dual purpose by allowing you to carry groceries and other items when your children aren’t with you. Once your children are old enough to ride their own bikes, this is likely to be the option preferred by both you and them. Note that giving your children their own bikes requires being able to leave them at the school and that unless you continue to carry a trailer with you, there is no way to give them a free ride when they’re feeling tired. You may be okay with biking through heavy traffic on your slick commuter bike, but you may feel very differently when your bike’s balance is thrown off by a child seat, the width of your bike is doubled by adding a trailer, or you have kids careening behind you on their own bikes. Double-check your route between your home, the school, and your workplace to make sure that the traffic levels are acceptable. Ideally, incorporate bike paths or roads with dedicated bike lanes into your route – especially when you are first starting out commuting with your kids – even if it means going slightly out of your way. Bike commuting is a great opportunity to ingrain safe bike practices into your children, such as wearing a helmet and adorning your bike with lights. Make sure that everyone in your group, including yourself – you’re the model for your kids – is wearing a helmet on every ride. In addition, not only your bike but also any trailer or tag-along you may be towing and your kids’ bikes, should be well lit from the front and rear with lights even if you don’t plan to be out at night. Yes, you fed your children a large breakfast right before leaving the house. But that won’t be any consolation when they start complaining about being hungry halfway through the ride to school. Plan and keep some snack bars and a water bottle on your bike just in case – these can also come in handy to lift their energy and spirits on days when they are tired and struggling with the commute. ​To make extra commuting fun and special for your kids, pack a special treat for them once every week or two. This will keep them excited about commuting so that they aren’t discouraged by the harder days. Even when the weather is calling for sunshine, be prepared for any weather with spare rain jackets and rain pants. There is nothing worse at the moment than a wet, cold, crying child, and being drenched and cold can sour your kids on bike commuting long beyond that one bad day. If you are bike commuting through the winter with your kids, make sure to invest in cold weather biking gear not only for yourself but also for them. If you want bike commuting to stick for your children and to make the most of the extra quality time you get to spend with them, make it fun! Make up a few games to play with your kids on the way or turn to tried and true favorite activities like “I Spy” or singing some favorite songs. Adding an extra stop and extra distance to your route will add time to your commute – but you also need to plan to be moving more slowly in general when bike commuting with your kids. Getting out of the door in the morning will be more difficult, and you’re likely to lose more time than you expect in dropping them off at school. 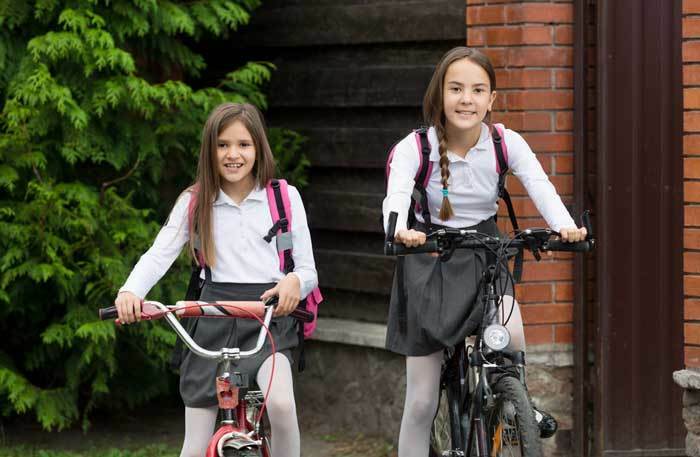 Plus, you’ll be carrying extra weight on your bike or moving at your child’s pace on the way to the school – and some days, they might not want to move much at all. Giving yourself plenty of time and being okay with being late now and then can make the whole experience of commuting with your kids less stressful and more fun overall. ​Bike commuting with your kids can be an enjoyable experience that lets you spend more quality time with your family and introduces your children to a healthy and fun lifelong habit. ​However, bike commuting with kids presents some significant challenges compared to commuting on your own, which you need to plan carefully for to ensure that you get to where you need to go and that your kids don’t end up hating bikes. These tips for commuting with kids can help you make sure that everyone in your family has a safe and happy commute to school and work.